It is very rarely I take the time to write a review, however, when you spend a lot of money on something serious like foundation repair and you deal with a professional company that went above and beyond, I feel it is strongly warranted. In summary, don’t worry about going anywhere else if you live in the Atlanta area for foundation/masonry work or concerns – I’m telling you, Anglin’s the best; I can’t speak highly enough about them. From start, to months beyond the job, these guys redefine customer satisfaction. I give them my highest marks – “ Good people”. Everything from the estimators working with you (Gus you are the best), to the hardworking and very experienced workers who took care of us ( Iggy et al), to Bill and Jill in the office who handled transferring the warranty for the work when we sold our home and all the stress that can go with that – Anglin’s has it right. Other companies didn’t even come close. Some would even not show up for an inspection. Other ( big names I won’t mention) companies wouldn’t send their estimates like they said they would. These guys came out, on time – every time. They charged rates that bear most of the competition, but they did so with great work; I know, I watched them entire time. They fixed little things that weren’t even included in the price, just because they had the free time on the job and the extra materials were already there. You just don’t find people like that anymore. I wanted to write this review because good people deserve good things. 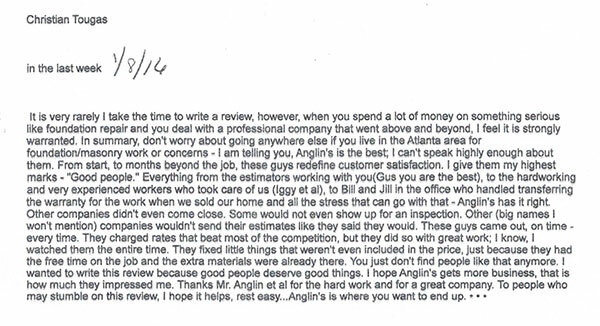 I hope Anglin’s gets more business, that is how much they impressed me. Thanks Mr. Anglin et al for the hard work and for a great company. To people who may stumble on this review, I hope it helps, rest easy … Anglin’s is where you want to end up.